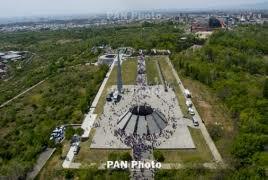 PanARMENIAN.Net - German Chancellor Angela Merkel on Friday, August 24 visited the Armenian Genocide memorial in Yerevan. Accompanied by Prime Minister Nikol Pashinyan, Merkel paid tribute to the memory of 1.5 million innocent victims of the Genocide, perpetrated at the hands of the Ottoman Empire in 1915-1923. Merkel was earlier in neighboring Georgia and is set to leave for Azerbaijan on Saturday. When in Yerevan, the German Chancellor will visit the Armenian Genocide memorial and hold high-level talks with top officials. The German Bundestag recognized the Armenian Genocide on June 2, 2016.